Movement Toward Definition, Marso Gallery, Mexico City, Mexico (May 21 – September 12). Petrified Acts, P.P.O.W, New York, New York (May 29 – June 28). 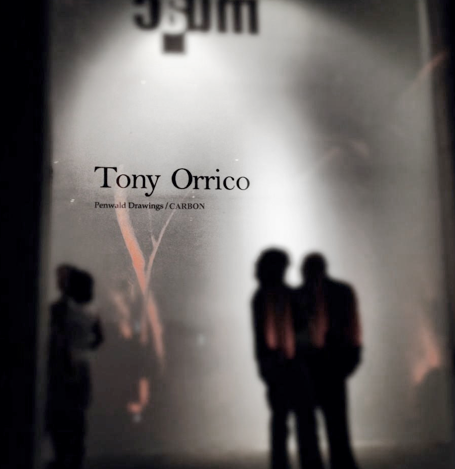 Tony Orrico, Finlandia University Gallery, Hancock, Michigan (February 27 – March 15). Expo Chicago, Marso Gallery, Chicago, Illinois (September 19 – 22). Penwald Drawings / CARBON, Museo Universitario de Arte Contemporaneo, Mexico City, Mexico (September 19 – September 21). CARBON, Polyforum Siqueiros, Mexico City, Mexico (April 19 – June 19). Penwald Drawings, Shoshana Wayne Gallery, Santa Monica, California (May 28 – July 16). An Unnamed Need: Pattern and Beauty in Contemporary Art, The Wriston Art Galleries at Lawrence University, Appleton, WI ( January – ). Think Math, The Leonardo Museum, Salt Lake City, Utah (June 13 – February 2016). Let’s Dance, Art Station: Stary Browar Art Center, Poznan, Poland (June 19 – October 18). Untitled, Marso Gallery, Mexico City, Mexico (December 3 – 7). For each gesture…, Art Station: Stary Browar Art Center, Poznan, Poland (January 14 – April 5). Zona Maco, Marso Gallery, Mexico City, Mexico (February 5 – 9). On what there might not be, Marso Gallery, Mexico City, Mexico (January 30 – March 22). Untitled, Marso Gallery, Mexico City, Mexico (December 4 – 8). My Brain is in My Inkstand, Cranbrook Museum of Art, Bloomfield Township, Michigan (November 16 – March 30). [Manœuvres], Voorkamer, Lier, Belgium (October 12 – November 17). Drawn to Experience: An Inquiry into Performance Drawing, POP Gallery, Queensland College of the Arts, Brisbane, Australia (September 9 – 22). Zona Maco, Marso Gallery, Mexico City, Mexico (April 10 – 14). Diálogos Contemporáneos, Museo Nacional de Arte, Mexico City, Mexico (September 25 – December 22). Falling through Space Drawn by the Line, UB Art Gallery, Buffalo, New York (September 20 – December 8). Drawing(a)live, Centro Diseño de Oaxaca, Oaxaca, Mexico (September 5 – 7). Drawing(a)live, Museo de Arte Moderno, Mexico City, Mexico (August 29 – September 21). In Our Wake, Farm Project Space Gallery, Wellfleet, Massachusetts (June 28 – July 9). Tripping the Line Fantastic, J. Johnson Gallery, Jacksonville Beach, Florida (April 13 – June 8). Pulse Miami, Shoshana Wayne Gallery, Miami, Florida (December 1 – 4). Contre-Façon, White Canvas Gallery, Nanjing, China (October 17 – 26). FLUX/S: Drafts Establishing Future, Strijp-S, Eindhoven, Netherlands (September 9 – 12). This House is Empty, 124 Ridge Street, New York, New York (April 17). Resident Artist at Centro de las Artes San Agustín, Oaxaca, México. Resident Artist at Bosco Sodi’s Casa Wabi, Puerto Escondido, Oaxaca, Mexico. Resident Artist at Stary Browar, Poznan, Poland. Guest Artist at Arizona State University, Phoenix, AZ. Guest Artist at Michigan Technological University, Houghton, MI. Lecturer at the Cranbrook Museum of Art, Bloomfield, MI. Guest Artist at McKinney Avenue Contemporary, Dallas, TX. Guest Artist at Christopher Newport University, Newport News, VA. Guest Artist at Danish Psoriasis Foundation, Copenhagen, Denmark. Resident Artist at Polyforum Siqueiros, Mexico City, Mexico. Guest Artist at University of Iowa, Department of Dance, Iowa City, IA. Lecturer at WE LIVE HERE, Frascati WG, Amsterdam, Netherlands. Residency for Canyon at MASS MoCA, North Adams, MA. Residency for Canyon at The Maggie Allesee National Center for Choreography, Florida State University. Guest Artist at Hollins University, Roanoke, VA.
Penwald: 2: 8 circles, 8 gestures, Center Pompidou-Metz, Metz, France (June 12). Penwald: 3: circle on knees, Center Pompidou-Metz, Metz, France (June 12). /Vessel for Governing and Conception/, P.P.O.W., New York, New York (May 28). Prepare the plane, P.P.O.W., New York, New York (May 27). Penwald: 8: 12 by 12 on knees, SCAD, Savannah, Georgia (February 18). Penwald: 12 by 12 on knees, Chicago Cultural Center, GAR Hall, Chicago, Illinois (September 17). Waning, Moving Dialogs: Part 4, Hyde Park Arts Center, Chicago, Illinois (September 16). Penwald: 16: cartograph, Djemal Residence, Mexico City, Mexico (June 14). Penwald: 3: circle on knees, Penwald: 6: project, recoil, Marso Gallery, Mexico City, Mexico (April 27). Penwald: 1: 1 circle, Penwald: 5: wrists on walk, Marso Gallery, Mexico City, Mexico (April 25). Penwald: 4: unison symmetry standing, Helium Space, Chicago, Illinois (March 21-22). Penwald: 4: unison symmetry standing: center circle, Breitling Residence, Las Vegas, Nevada (Feb 8). Penwald: 4: unison symmetry standing: center circle, Williams College Museum of Art, Williamstown, Massachusetts (October 18). Penwald: 15: fourths and quarters, New Museum, New York, New York (September 22). Penwald: 4: unison symmetry standing: center circle, Keep Memory Alive: Rodeo, Glenbrook, Nevada (July 21). Penwald: 8: 12 by 12 on knees, Museo Nacional de Arte, Mexico City, Mexico (April 21). Penwald: 3: circle on knees, Poptech: World Rebalancing, Camden, Maine (October 22). Penwald: 4: unison symmetry standing, Grand Rapids Art Museum, Grand Rapids, Michigan (September 18 -20). Penwald: 7: 4 ¾ turns left, Paradiso, Amsterdam, Netherlands (July 8 – 9). Penwald: 2: 8 circles: 8 gestures, Centre de Cultura Contemporania de Barcelona, La Porta’11, Barcelona, Spain (March 10). Penwald: 6: project, recoil, Penwald: 5: wrists on walk, WhyNot! 2, Gallery W139, Amsterdam, Netherlands (January 7 – 8). Penwald: 4: unison symmetry standing, Dance Theater Workshop, New York, New York (August 31 – September 2). Penwald: 2: 8 circles: 8 gestures, National Academy of Sciences, Washington DC (May 20). Penwald: 4: unison symmetry standing: center circle, Screwball Spaces, Brooklyn, New York (May 1). Penwald: 1: 1 circle, Penwald: 3: circle on knees, Culture Shock V, Brooklyn Urban Sanctuary, New York (April 15). Penwald: 3: circle on knees, FACADE/FASAD, Brooklyn, New York (April 10). Penwald: 3: circle on knees, Red Horse Café, Brooklyn, New York (September 24). Penwald: 4: 8 circles, Placemark, Hudson, New York (August 9). Penwald: 1: 1 circle, Postmaster’s Gallery, New York, New York (June 21).